Splat the Cat wakes up early on his first day at Cat School. He is worried about starting school and makes all sorts of excuses for not going: he’s having a bad hair day, or the gate won’t let go of his fingers. Mum, however, has an answer for everything, so he makes sure he has his pet mouse, Seymour, in his lunch box for company, and off they go. Arriving at school, Splat is welcomed by his teacher, the buxom Mrs Wimpydimple, another feline of course. The other cats in the class (who all seem to be grey whilst Splat is black) give Splat a friendly welcome. Mrs Wimpydimple begins her lesson about cats on the blackboard. When she mentions that cats chase mice, however, Splat wants to know why but doesn’t let on that he has a pet one in his lunch box. Splat asks why so many times that Mrs Wimpydimple sighs and announces that it is time for lunch. When Splat opens his lunch box and his classmates notice Seymour, they immediately start to chase the poor mouse. Seymour frightens them by hiding behind a glass bottle that magnifies his face and makes him look like a monster. They flee, Seymour chases them, and they all knock poor Splat flat on his back. To calm them down Mrs Wimpydimple declares that it is milk time, but she cannot open the milk cupboard. Seymour saves the day when he finds a tiny hole through which to enter the cupboard and is able to open the door from inside. His skill and resourcefulness prompt Mrs Wimpydimple to write on the board ‘Cats don’t chase mice’, which rouses a cheer from the class. Mum comes to take Splat home and on the way he tells her that he has made lots of friend. The following morning when he wakes up his tail is wiggling with excitement rather than the worry of the previous morning. 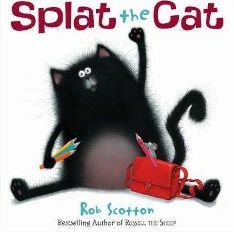 Rob Scotton, of ‘Russell the Sheep’ fame, has created another character and story full of delight and humour in ‘Splat the Cat’. Whilst not being the first book on the trauma of starting school, this is an original take on the idea. The cats behave like typical cats in some ways, but Scotton depicts them as people who wear clothes, ride bikes and walk on two legs. Strangely enough, Splat himself doesn’t wear anything, except that he has a small red helmet when he is on his bike. Scotton’s illustrations are charming. Splat has a lovely furry body and head but his legs are like matchsticks and his tail is extremely long and wiggly. We see his classmates welcoming him with big grins, some with missing teeth, some wearing glasses, and one hugging a Russell the Sheep toy. There are lots of little amusing details, such as a notice attached to a drainpipe that states ‘Strictly no dogs’, and many others that do not require any reading. My only criticism would be that not many bright colours have been used; there is rather too much grey, and even the clothes of the cat pupils are mostly dull turquoises, greens and mauves. The font used for the text is large and clear. It usually appears on a white background other than a few pages where it is superimposed on a light grey area of an illustration. Sometimes a very large font is used for one or two words, for instance when the cats all shout “Mouse!” or “Hurray!” The amount of text on each page is never so much that a young child will get bored and want to turn over too soon. This is of course an ideal book for a four-year-old who is approaching the time to start school, as the story is intended to make children feel that school is a place to have fun and make friends rather than a place to cause worry. Because of the humour, however, a three-year-old could also get a lot of enjoyment from ‘Splat the Cat‘, and I’m sure a five-year-old would not find it too babyish. A young independent reader with some degree of confidence might enjoy reading the book alone; the illustrations will provide encouragement as well as clues to what is going on. The story itself may not be wildly exciting, but I would recommend ‘Splat the Cat‘ as an entertaining read-aloud book. The humour and illustrations make it a book that most young children would enjoy listening to and looking at again and again. No Comments on "Splat the Cat"